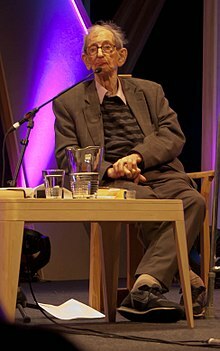 Eric John Ernest Hobsbawm, naixito d'Aleixandría (Soldanato d'Echipto, hue Echipto) o 9 de chunio de 1917 y muerto en Londres (Reino Unito) l'1 d'octubre de 2012, estió un destacato historiador marxista britanico. D'entre a suya abundant obra historiografica, puet destacar-se libros como The Age of Revolution: Europe 1789–1848, The Age of Capital: 1848-1875 u The Age of Empire: 1875–1914. 1948: Labour's Turning Point: Extracts from Contemporary Sources ISBN 0-901759-65-1. 1959: Primitive Rebels: Studies in Archaic Forms of Social Movement in the 19th and 20th centuries ISBN 0-7190-0493-4 Reeditato en 1963 y 1971. 1962: The Age of Revolution: Europe 1789-1848 ISBN 0-679-77253-7. 1964: Labouring Men: studies in the history of labour ISBN 0-297-76402-0. 1965: Pre-Capitalist Economic Formations ISBN 0-7178-0165-9 (editor; ensayos de Karl Marx). 1968: Industry and Empire: From 1750 to the Present Day ISBN 0-14-013749-1. 1969: Captain Swing ISBN 0-85315-175-X (con George Rudé). 1973: Revolutionaries: Contemporary EssaysISBN 0-297-76549-3. 1975: The Age of Capital: 1848-1875 ISBN 0-297-76992-8. 1977: Italian Road to Socialism: An Interview by Eric Hobsbawm with Giorgio Napolitano ISBN 0-88208-082-2. 1982: The History of Marxism: Marxism in Marx's day, Vol. 1 ISBN 0-253-32812-8 (editor). 1983: The Invention of Tradition ISBN 0-521-43773-3 (editor, con Terence Ranger). 1984: Worlds of Labour: further studies in the history of labour ISBN 0-297-78509-5. 1987: The Age of Empire: 1875-1914 ISBN 0-521-43773-3. 1990: Echoes of the Marseillaise: two centuries look back on the French Revolution ISBN 0-86091-937-4. 1991: Nations and Nationalism Since 1780: programme, myth, reality ISBN 0-521-43961-2. 1994: The Age of Extremes: the short twentieth century, 1914–1991 ISBN 0-679-73005-2. 1996: Art and Power: Europe Under the Dictators, catalogo d'a exhibición en o Deutsches Historisches Museum. 1997: On History ISBN 0-349-11050-6. 1998: 1968 Magnum Throughout the World ISBN 2-85025-588-2 (editor, con Marc Weitzmann). 1998: Behind the Times: decline and fall of the twentieth-century avant-gardes ISBN 0-500-55031-X. 1998: Uncommon People: resistance, rebellion and jazz ISBN 0-297-81916-X. 1998: Karl Marx y Friedrich Engels, The Communist Manifesto: a modern edition ISBN 1-85984-898-2 (editor). 2000: The New Century: in Conversation with Antonio Polito ISBN 0-316-85429-8. 2002: Interesting Times: a twentieth-Century life ISBN 0-7139-9581-5 (autobiografía). 2007: Globalisation, Democracy and Terrorism ISBN 0-316-02782-0. 2011: How to Change the World: Tales of Marx and Marxism ISBN 1-4087-0287-8.